In 2014, Babalwa Latsha’s mother asked her if she had lost her mind when she found out that her daughter took up rugby, and four years later, the Western Province prop is on the verge of earning her first Test cap for the Springbok Women. Latsha has had a meteoric rise in rugby in the last few years after being asked to fill the last spot in the University of the Western Cape’s Women’s Sevens team for the University Sports South Africa (USSA) games in 2014 despite not knowing much about the game. It was a steep learning curve but she carefully studied her opponents and other players, and after working very hard Latsha was named in the SA Students Women’s team before being drafted into Western Province’s 15-a-side team in 2015. A year later, she was named the union’s Women’s Player of the Year, and in 2017 she earned the SA Rugby’s Women’s top achiever award. 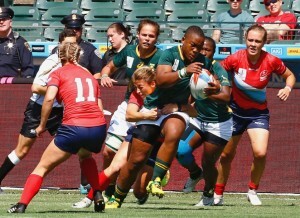 Latsha had her first taste of international rugby in 2017 when she toured the UK with the SA Select Women’s team where they faced the British Army and the England Academy team, and went on to represent the Springbok Women’s Sevens team in the Rugby World Cup Sevens in San Francisco in July. Only a few months later she is in line to earn her first Test cap for the Springbok Women when they travel to Europe next week for matches against Wales, Spain and Italy. “My mother’s initial reaction when I told her I took up rugby was ‘have you lost your mind’,” said the final year LLB student. Commenting on the possibility of playing her first Test, Latsha said: “It is very exciting. But this means a lot more to me than playing my first Test. Looking back at her first rugby game in the USSA Sevens, Latsha admitted that until being asked to play she did not know women’s rugby existed, and that her brief from the coach when injuries forced her to take to the field was simply to catch the ball and run. “When I was asked to play, I thought to myself, I have to do this because I have to see what women’s rugby is all about,” said Latsha. Latsha’s main ambitions in the next few years is to complete her articles and to become a qualified attorney, while her big rugby dream is to represent the Springbok Women at the 2021 Women’s Rugby World Cup. The Springbok Women will depart for London on Tuesday, where they will kick off their tour on Friday, 2 November, against the UK Armed Forces, and after five days of training in Stellenbosch, Latsha spoke of their preparations with a broad smile. “There is a buzz in camp; the players are very excited,” she said. “We have been working very hard at training and the players are focused on the job at hand. Everyone is looking forward to going on tour and playing in official Test matches, so we will continue to put in the hard yards in the next few days and hopefully we will do well over there.